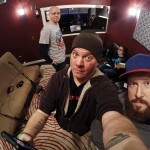 Recorded and produced every week by Internet marketing company Coal Creative in their production studio in downtown Wilkes-Barre, the NEPA Scene Podcast presents honest, uncensored interviews and in-depth discussions about local arts, entertainment, and the issues that matter to Northeastern Pennsylvania. The NEPA Scene Podcast is made possible by local sponsors Beer Boys, The Keys, and the F.M. Kirby Center, Coal Creative, and viewers who tune in every week. In Episode 21, we sit down with Jess Meoni, a graphic designer, writer, editor of Ruthless Zine, and organizer of The Bad Trip Psychedelic Show – a free concert on Saturday, Aug. 12 on Courthouse Square in downtown Scranton with Piece of Mind, Walau-eh, Signs & Wonders, Earthmouth, The Mysteries, Mind Choir, and High Noon – along with Grrrls Night at Ale Mary’s in Scranton, Scranton Zine Fest, and many other community events in NEPA. Before and during the interview, we drink some crowlers provided by Beer Boys in Wilkes-Barre, this time with a blueberry theme. We try Becky Blueberry Cider by Platform Beer Company, which is new to the area, Blueberry Belch by Fegley’s Brew Works in Allentown, and Sea Dog Blueberry Wheat Ale by Sea Dog Brewing Company, comparing each of their flavors and styles. We discuss how The Bad Trip came about, a new wave of psychedelic-influenced local bands, working with the city and the county on events, what goes into organizing a community event, the importance of putting events together yourself rather than waiting for someone else to do it and inspiring others to do the same, why she personally feels the need to create niche but inclusive events, ignoring naysayers like on Talkback 16, how people are shaped by concerts and other events, highlighting local female artists at the Grrrls Night open mic and a recent surprise engagement, how crowds and venues have changed over the years, saving The Marketplace at Steamtown, and more. We also answer some questions and comments from live viewers. In The Last Word segment, we talk about Wilkes-Barre’s first Multicultural Parade & Festival. We talk about why it was special and important, the local naysayers who were proven wrong about diversity, and Brittany describes her experience at the festival.